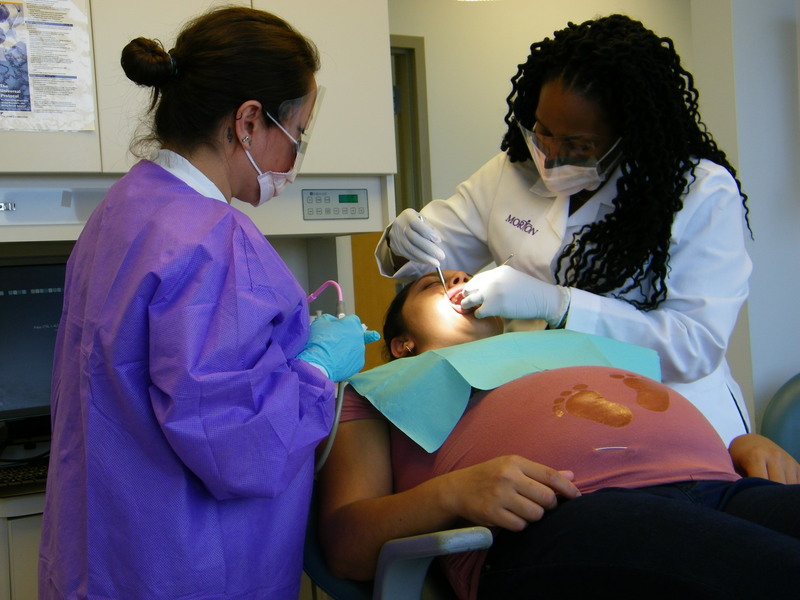 Dr. Calysta Beatty (r), director of Dentistry, and dental assistant Maria O’Donnell examine a patient. The goal of the Dental department is to offer care for optimal oral health through comprehensive and preventative care. The department provides the following services: complete exams; emergency exams; cleanings and fluoride treatment; composite, amalgam; deep scaling; periodontal therapy; root planning; sealants; stainless steel crowns and nitrous oxide sedation (both for children only) and extractions. The department can diagnose a patient’s dental needs with greater accuracy with its digital x-ray and electronic medical records system. Dental services are available at the main office location, Midtown and in Nowata, Monday – Friday, 8:30 a.m. – 5:30 p.m. On Saturdays, dental services are available by appointment at the main office location. To make an appointment, call (918) 587-2171.